Docker or rkt or Singularity, Oh My! An important part of our architecture is the ability to run specified bioinformatics tasks against data sets; but this requires the ability to bundle up these tasks and distribute them across potentially quite heterogenous sites. We were benchmarking performance, but also maintainability, security, composability, and infrastructure needed on sites to support. VMs were quickly ruled out as an awkward fit for our use case, that of running one of a very large number of specific, discrete, typically short-running tasks against single data sets. Similarly, most application packagers are very desktop-focussed, requiring installation in some sort of local repository — an uncomfortable fit for our system of likely more transient nodes. 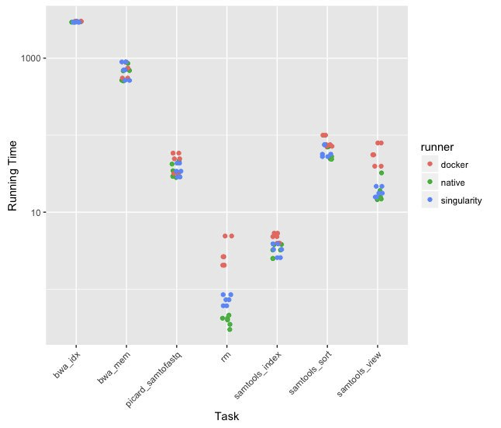 Among container options, most performed roughly equally well; there was a slight startup penalty (and perhaps a very slight IOPS overhead) for docker or rkt run with typical isolation; otherwise, and particularly for long-running tasks, performance results were roughly identical. For maintainability and composability, most of the container options were similar; all allow ready automation at the level we need, and transparency as to the content of executables, library versions, etc. The main differences came down to isolation. In our regime — where tasks will be running as unprivledged users in sandboxes, with only (authenticated) API access to data, container-level isolation is not particularly important to us. In that case, the need for privledged users running support daemons for Docker is likely too high a price to pay for the very nice tooling available, especially with open container standards making most of that tooling available to other container types. Rkt does not have those same requirements, and more readily allows the turning up or down of isolation levels for containers, all the way down to simply running chrooted executables, which is the regime where Singularity plays. In the near term then, we’ll be using docker as some of our components still require it, but we anticipate moving to Singularity (with rkt as a backup) in the near future.